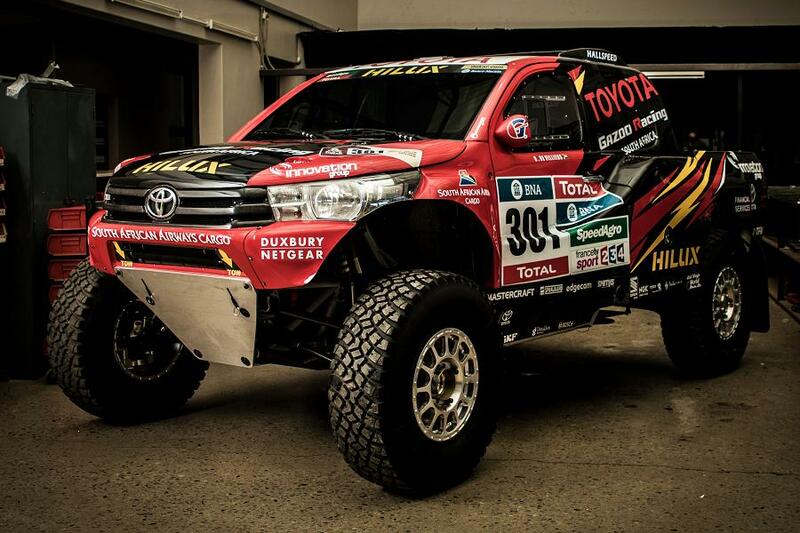 Next year’s Dakar Rally entry list is going to include a special Hilux built by Toyota South Africa Motors and Toyota Gazoo Racing. Compared to the showroom model, it’s definitely very different. For starters, power is provided by a mid-mounted, normally-aspirated V8 engine that sends output to the rear wheels only. The absence of a four-wheel drive system is one factor that’s helping to keep the pick-up’s weight down to around 1,300 kg (2,866 lbs). To cope with the challenging route that’ll run through Paraguay, Bolivia and Argentina, longer travel suspension is fitted. Furthermore the wheels and tyres are much larger than standard, plus they’re supported by an onboard inflation / deflation device. 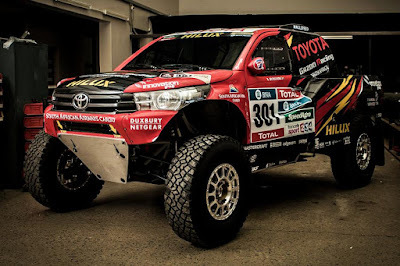 According to Glyn Hall, Team Principal of Toyota Gazoo Racing SA, “Essentially, this is our take on what a two-wheel drive Dakar challenger should be. Three examples of the Hilux Evo are due to participate in the 2017 Dakar, crewed by Nasser Al-Attiyah / Matthieu Baumel, Leeroy Poulter / Rob Howie and Giniel de Villiers / Dirk von Zitzewitz. The event begins on the 2nd of January.